day 3186: a few scenes from The Last Open Skate of The Season. 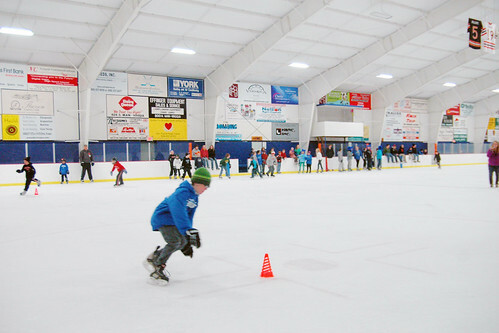 while we’re Beginning of The Neverending Hockey Season in the big city of onalaska, wisconsin, our community ice arena is closing down for the season in our little town of viroqua which means The Last Open Skate of The Season is upon us. what will we do from 6-8pm on saturdays and sundays?! i thought it’d be fun to see if i can still shoot clumsy video and skate at the same time while attempting to avoid the rink rats. is it just me or does odin appear to take out a kid on the ice as he races around the rink? whoops! after skating around for an hour with his poppi ( yes, he still tolerates me skating with him for awhile before ditching me for his buddies ), it’s time for The Races! and yes, he won again. but next year he’ll migrate to the next age group and have to skate against the 9 and 10 year olds. so this might be his last win for awhile. but maybe not, he’s pretty fast. 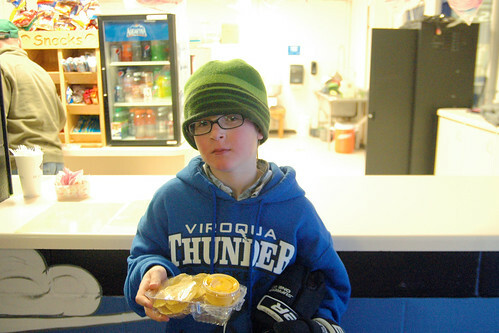 and so The Last Open Skate of The Season ends, with The Prized Nacho with Weird Cheese Food in hand and maybe just a bit of an attitude about his poppi taking his picture.